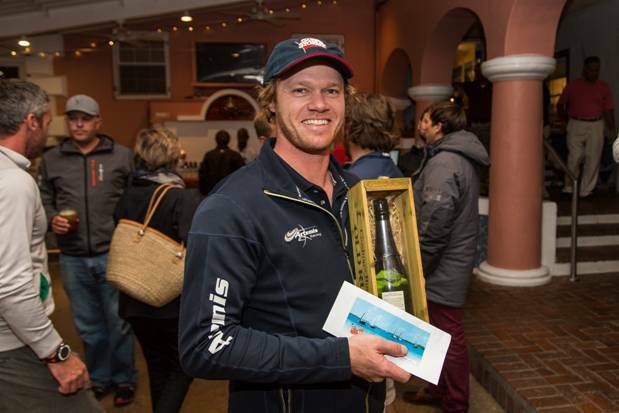 Artemis Racing helmsman Nathan Outteridge won the Amlin International Moth Regatta “Dash for Cash” today [Dec 6] during the final day of practice before the regatta. For winning the race on Hamilton Harbour, Outteridge won $500 and a bottle of Gosling’s Gold Seal rum. In accepting the award he donated the cash to the America’s Cup Endeavour Community Sailing Fund, and he kept the bottle of rum. The Endeavour Programme aims to provide a pathway to success for youth in Bermuda across all backgrounds as they experience an interactive curriculum labeled STEAM [Science, Technology, Engineering, Arts and Math], water safety knowledge and an opportunity to develop life skills through a community sailing program. Outteridge, a two-time Moth world champion, won’t be able to race the regatta this week due to commitments with Artemis Racing. The final list of entrants includes 58 from 14 countries and includes the reigning European Champion, Rob Greenhalgh, the reigning US champion, Anthony Kotoun, and a slew of America’s Cup sailors including Dean Barker, Francesco Bruni, Chris Draper, Paul Goodison, Kyle Langford and Tom Slingsby. Racing will be held on Great Sound and up to three races per day are planned.